It's just before sunrise at Bear Lake on a placid morning in Rocky Mountain National Park. The water of Bear Lake are calm and smooth and mist and fog skirts over the surface of the still waters. Wispy clouds over Hallet Peak turn pink and magenta as sunrise nears. 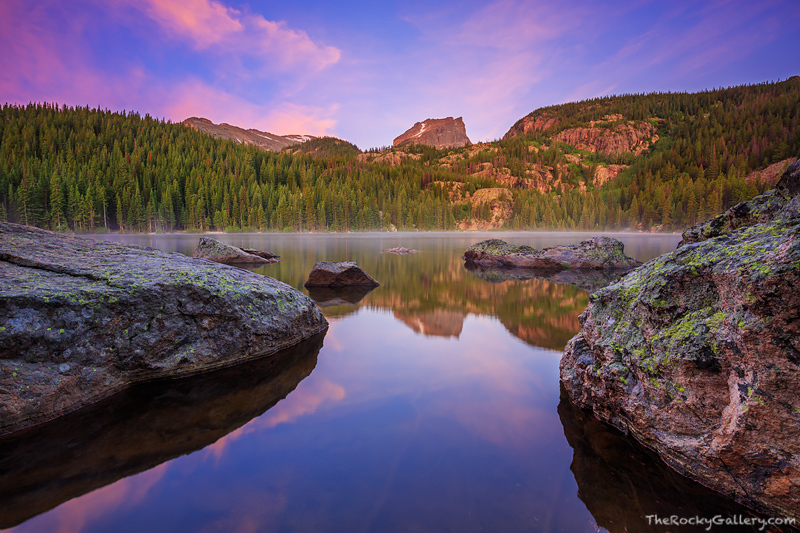 Bear Lake may be one of the most popular destinations in all of Rocky Mountain National Park, but arrive before sunrise and it can be as quiet and peaceful as any of the more desolate locations in Rocky. Photo © copyright by Thomas Mangan.